The magnetic field of Jupiter has been found to be different from all other known planetary magnetic fields. This result could have major implications for our understanding of the interiors of giant planets. Chris Jones is in the Department of Applied Mathematics, University of Leeds, Leeds LS2 9JT, UK. NASA’s Juno spacecraft is currently mapping Jupiter’s magnetic field in unprecedented detail. Because the field originates in the planet’s interior, it can provide insights into what is going on beneath the spectacular swirling clouds in the planet’s surface layers. 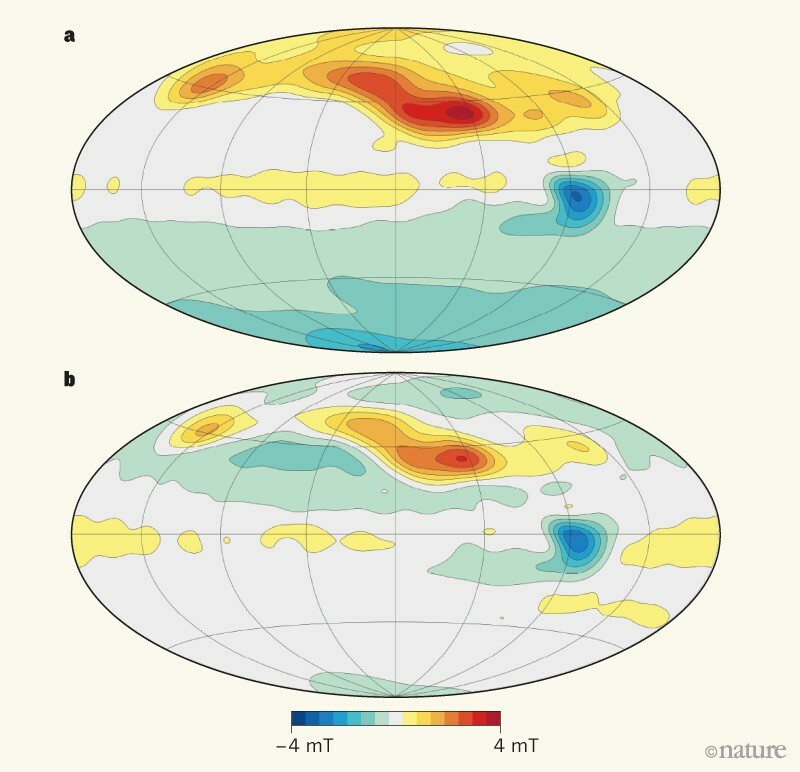 In a paper in Nature, Moore et al.1 analyse data from Juno and find that Jupiter’s magnetic field is substantially different in the planet’s northern and southern hemispheres. The authors consider what might be happening in the planet’s interior to account for this asymmetry. Juno reached Jupiter on 4 July 2016, and it has been gathering data that are transforming our understanding of the planet’s deep interior. Previously, we had only a broad-brush overview of Jupiter’s magnetic field2. Juno has brought the picture into much sharper focus, allowing a revised model of the field to be constructed3. These advances were possible owing to the close approach that Juno makes to Jupiter — the spacecraft flies only about 4,000 kilometres above Jupiter’s surface as it dives into the planet’s gravitational field once every 53 days4. Jupiter has the strongest planetary magnetic field in the Solar System. Ironically, this field is the biggest threat to the Juno mission. High-energy particles from the Sun are trapped in the field, producing a hazard that is dangerous to the electronics on which the mission depends. Fortunately, Juno was designed with protection against this and has survived so far. The magnetic field of Jupiter is maintained by electric currents that flow in the planet’s interior. Jupiter is made up mainly of hydrogen and helium, so it is quite surprising that it can conduct electricity at all. However, the extremely high pressure and density in the planet enable hydrogen to enter a state known as metallic hydrogen5. Metallic hydrogen has an electrical conductivity similar to that of metals, allowing electric currents to flow. Giant planets take billions of years to cool down after they are formed. Consequently, there is as much heat coming out of Jupiter’s interior as is received by the planet from the Sun. This heat is carried by convection currents, which stir the interior and produce the swirling clouds and storms — such as the Great Red Spot — that are so beautifully captured by Juno’s cameras. The convection-driven flows of fluid in the interior are slower than the surface winds, but they are strong enough to generate Jupiter’s magnetic field by a process called dynamo action6,7. Earth’s magnetic field is also produced by convection-driven flows in the planet’s interior, but it is the planet’s liquid-iron core that allows electric currents to flow. The fields of both Jupiter and Earth are mainly dipolar — the radial component of the field is mostly positive in the northern hemisphere and mostly negative in the southern hemisphere, as if the planet contained a bar magnet (Fig. 1a). Moore and colleagues report that the non-dipolar part of Jupiter’s field is confined almost entirely to the northern hemisphere (Fig. 1b). This is in stark contrast to Earth’s field, for which the non-dipolar part is evenly distributed between the two hemispheres. Moore et al. suggest several possible explanations for the morphology of Jupiter’s magnetic field. One explanation concerns Jupiter’s core, the nature of which is still a mystery. Some models of the planet assume a compact core with a mass about five times that of Earth8. But a much larger, dilute core is also feasible9, and could affect field generation. Another explanation is that there are one or more stable layers of fluid deep inside Jupiter. Saturn is thought to have a stable layer in its interior, which could account for why its magnetic field is almost completely symmetrical about the planet’s rotation axis10 — vastly different from the fields of Jupiter and Earth. In Jupiter, these stable layers might be regions in which the composition of the fluid changes, partitioning the planet’s interior into zones. If the transition regions contained a helium concentration gradient, they could be bottom heavy, altering the fluid flow inside the planet and therefore the magnetic field. To investigate how planetary magnetic fields are generated, it is now possible to solve the fundamental equations that govern the fluid flows and the magnetic fields inside planets. The basic principles of dynamo action were laid down a century ago11, but solving the fluid–dynamo equations proved difficult. Computers have been able to handle the calculations required to model Earth’s dynamo only since 199512. 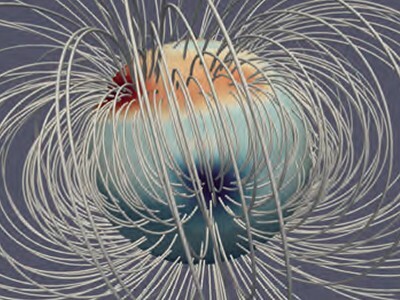 Nevertheless, much progress has been made, and computational models of dynamos can now capture many of the characteristics of Earth’s magnetic field13. In the past five years, these models have been adapted to deal with the large variations in density between the interior and atmosphere of Jupiter6,7, and can now be compared with the field inferred by Moore and colleagues. However, dynamo models depend on the internal structure of the planet, which in turn depends on the planet’s thermodynamic properties, electrical-conductivity profile and composition. Although these issues have been extensively explored, some uncertainty remains. Models of fields that are dipolar but broadly symmetric about the equator have been developed6, as have models of fields that are asymmetric but not dipolar14. The challenge is therefore to formulate models of fields that are both asymmetric and dipolar. Moore and colleagues’ suggested explanations for Jupiter’s field morphology can now be tested by dynamo modellers to discover whether the explanations are indeed compatible with Juno’s observations. Exciting times lie ahead for the study of the interiors of giant planets, as modellers digest the information coming from Juno and begin to work out a clearer picture of the inside of Jupiter. Moore, K. M. et al. Nature 561, 76–78 (2018). Ridley, V. A. & Holme, R. J. Geophys. Res. Planets 121, 309–337 (2016). Connerney, J. E. P. et al. Geophys. Res. Lett. 45, 2590–2596 (2018). Bolton, S., Levin, S. & Bagenal, F. Geophys. Res. Lett. 44, 7663–7667 (2017). Wigner, E. & Huntington, H. B. J. Chem. Phys. 3, 764–770 (1935). Jones, C. A. Icarus 241, 148–159 (2014). Gastine, T., Wicht, J., Duarte, L. D. V., Heimpel, M. & Becker, A. Geophys. Res. Lett. 41, 5410–5419 (2014). French, M. et al. Astrophys. J. Suppl. Ser. 202, 5–16 (2012). Wahl, S. M. et al. Geophys. Res. Lett. 44, 4649–4659 (2017). Stevenson, D. J. Geophys. Astrophys. Fluid. Dyn. 21, 113–127 (1982). Larmor, J. Rep. Br. Assoc. Adv. Sci. 87, 159–160 (1919). Glatzmaier, G. A. & Roberts, P. H. Nature 377, 203–209 (1995). Schaeffer, N., Jault, D., Nataf, H.-C. & Fournier, A. Geophys. J. Int. 211, 1–29 (2017). Dietrich, W. & Jones, C. A. Icarus 305, 15–32 (2018).